There are dozens of videos on YouTube demonstrating the “proper” way to create a hairline. In all reality, these demonstrations are incorrect and unjustifiably promote hairline modification. A soft, natural hairline that has been-recreated from the client’s lost one is a desired feature of The Weston System. scalp location to the forehead will present pigments problems down the road. I never create a hairline that is unnatural to the face or one that the man was not born with, as this can be very unflattering. For instance, some of my clients request a specific hairline of their favorite actor’s during the consultation process. While these hairlines fit these actors’ faces naturally, they most likely will not fit the particular recipient’s face. I routinely discuss hairlines with the client on the initial phone consultation and if they insist on a “fake” hairline, I decline them as a client. I will not sacrifice the end look of my System knowing that the client will be dissatisfied in later years. The best hairline is the one you were born with, even though many may be dissatisfied with them. For instance, the very sharp and straight hairline known as the “edged-up” hairline that many companies now are promoting just don’t fit on most men. If you are an African-American man or of Hispanic decent, this is natural and is very appealing. But on a Caucasian man, sharp temples that protrude way forward evenly with the eyes are unnatural. These cookie-cutter methods certainly are not appealing on men over 35. In addition, the widow’s peak seems to be another current trend that not everyone was born with. This is what you can expect from the simulation programs that many providers push. These programs apply the same hairline to every face, regardless of face shape, eyebrows, ear positioning and many other factors. The original lost hairline is not even addressed. Don’t end up looking like this. A comment on some of the hair simulation programs that some providers are offering. Don’t be swept into a sales pitch by the promise of your new look with one of these programs. These “virtual hairstyle” programs are generic and should not be used to provide the client with an accurate end result. They were designed for beauty salons to “try” different hair styles for women. These programs are not specific enough to take into consideration the actual client’s face shape, eyebrows, ear positioning and many other factors. They also cannot determine where the client’s previous hairline was. The only type of program that can accurately simulate a finished hairline is those that are designed for law enforcement agencies. With these programs, an actual photo of the person is scanned into the program, thereby creating a projected image with specific known features, as well as a hairline. These programs are for law enforcement use only and cannot be purchased by the layman. 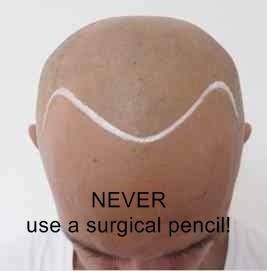 A surgical grease pencil should never be used to establish your hairline. The mid-point of this frontal hairline is even off-centered to the right. The tech here obviously did not measure anything! The technician here has brought the temple area too far forward and she will fill in behind the grease pencil. If a different marking system was used, she may have been able to establish a softer temple line. 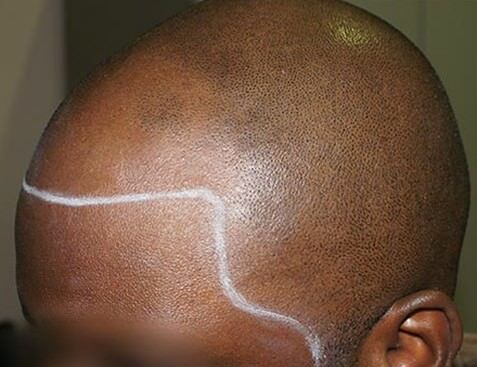 While sharper and more defined hairlines are acceptable on most African-American men, this technician brought the hairline down way to far on the forehead; not following the original lost one. Let’s talk about how these unnatural hairlines start. The norm in the multi-session industry is the use of a surgical grease pencil. This is one of the worst hairlines seen. Not only is the hairline crooked and way too low, it dips down on the forehead on his left. The temples were brought too far forward into the man’s forehead frown lines. The fake scar calls even more attention to this horrendous hairline. This man is a technician for a well-known company. Not a good example for clients. 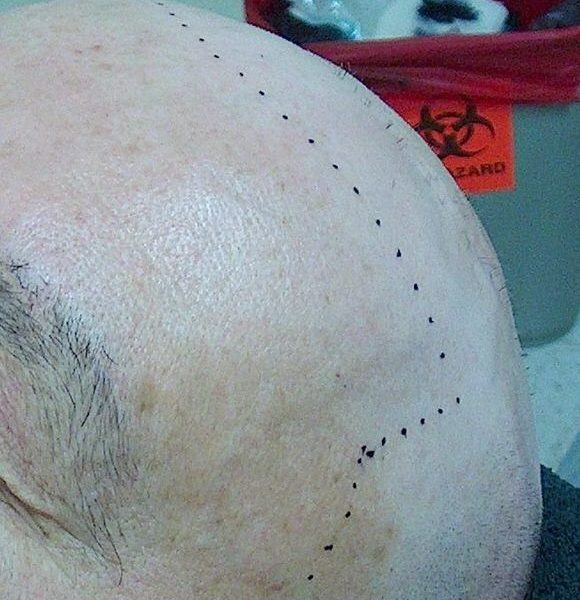 Here are some examples how providers use these to mark out the hairline. It is hard to understand how a tech can even begin to see the man’s natural hairline with a thick crayon-type stripe around their head. It is impossible to work around this thick line to be able to produce a soft and natural hairline. The hard line dictates where the points will be placed with no room for variation, thereby creating the hard, straight hairline that is so commonly seen. Another example of an inartistic hairline just quickly drawn on. Favorably called the “edged-up” look by companies, this look does not compliment all men. The hairline is just drawn on not taking into consideration the client’s face shape, location of eyebrows or even the location of the ears to the temple areas. In some cases, techs apply the pigment over top of the grease pencil thereby pushing the pencil into the scalp with the needle. This is how hairlines are re-created with The Weston System℠. By doing so, the former natural hairline is visible the entire time it is being re-created. Points are placed irregularly above and below the broken guide. This client was a hair-system wearer. An inexperienced technician would have marked out the hairline by following the color difference where the hair system was worn. But in fact, the pale area is not the original and natural hairline. You can see some examples of naturally re-created hairlines in paragraph 3 on the Weston Difference page. It cannot be stressed enough that only lost natural hairlines be recreated. Many companies are novices and have not seen the results of their “created” hairlines years later. 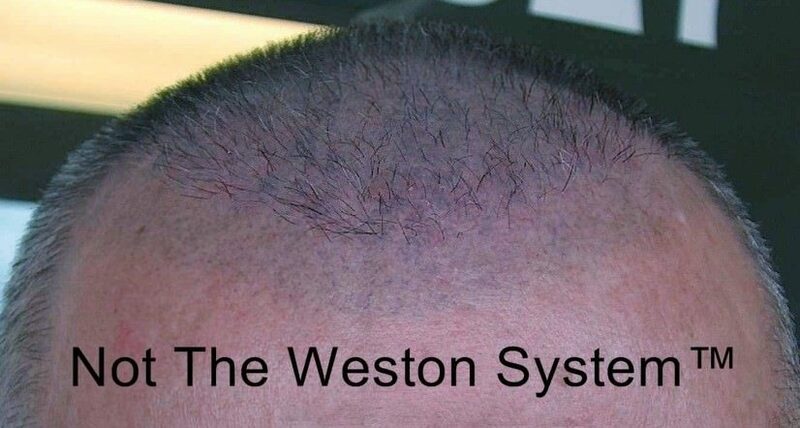 Weston System℠ hairlines can take as long as an hour or two to re-create. Most men have one ear that is sightly lower/higher than the other. Specific measurements must be taken from the mid-point of the eyebrows, ears, nose and around the back of the head. If facial asymmetry features are not even (most are not), then almost an optical illusion must be created with the hairline to offset the measurements to create a natural and pleasing end result. There is also warning about dropping hairlines down out of the natural scalp line into the forehead skin. 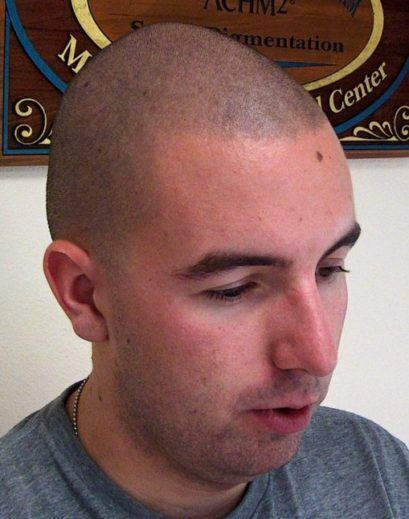 Scalp micropigmentation multi-session technicians can be overzealous in trying to please the client. The scalp skin has an entirely different consistency and texture from the forehead skin and accepts pigment very differently. To an experienced artist, it is evident that the pores on the forehead skin are clearly different from those of the scalp skin. When a hairline is dropped below the scalp skin, the pigment will cure differently in the forehead skin than in the scalp skin and the color will not match. The client will end up with an off-color stripe on the front of their head. This may not even be evident until months or even years later. Re-created unnatural widow’s peaks will later turn into a mismatched triangular spot in the middle of the forehead and the same scenario for “edged-up” hairlines. This was a correction case for Artistry Concepts some years ago. 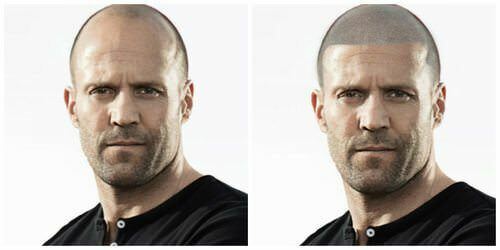 The provider required the client to blade shave his head and established a new hairline that was below the one the hair transplant surgeon created. When the client opted to grow his hair out, the off-color stripe was evident. This client was lucky that the multi-session pigmentation he received was temporary only (lasted less than a year). The off-color stripe should eventually fade almost completely. This also applies to the hair transplant recipient who has already had a hairline established by the surgeon. Never have the pigment applied outside of the HT frontal hairline, perhaps except for some very slight modification to even a hairline. Scarring takes pigment very differently and I never drop a hairline below the hairline already established by a hair transplant surgeon. The Weston Centers routinely receive many inquiries from clients whom are not happy with the hairlines they received from other providers. 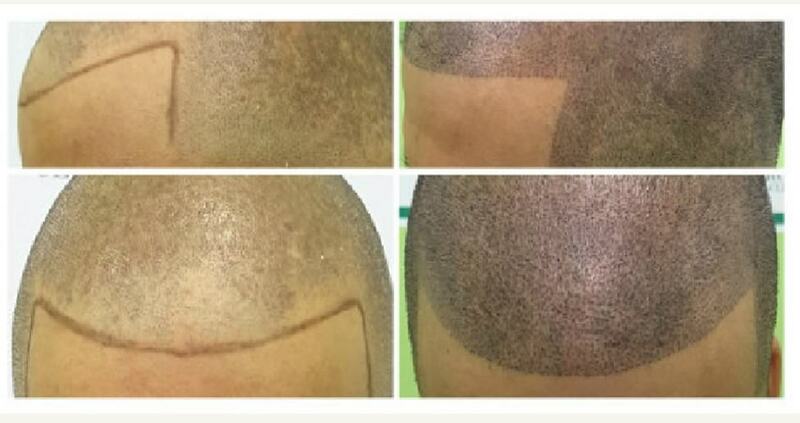 Unfortunately, usually the only fix is for laser removal if the hairline was created too low or straight. In addition, Weston’s SMART Pigments® will not match what the client already has received elsewhere. Again, laser removal of the previous pigmentation is necessary in most cases unless the pigment has already faded dramatically. One thought on "Hairline Modification"
This is one of the most comprehensive articles I have seen on this subject. Actually, it is the only article I have seen. I didn’t really realize about the marking of the hairlines while watching these videos until I read this article. Makes perfect sense to me. No wonder most smp companies hairlines look the same and fake.